De provence Drenthe is pilot for a regional exploration of the future in sport. This is made possible by RIVM, Mulier Instituut, Vereniging Sport en Gemeenten, het kenniscentrum Sport en NOC*NSF. The National Sport Future Exploration and the National Sport Agreement are the reason to think about the future of sport regional and local. The 50th anniversary of SportDrenthe and the title Drenthe European Community of Sport make Drenthe THE candidate for this pilot. Eventually there will be a provincial vission (that may be the start for a provincial sportsagreement) on sport and exercise in 2030 and a jointly section on the theme of prevention (that may be a part of a provincial prevention agreement). 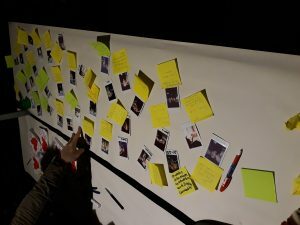 During the newyear event of Community of Sport 2019 at the TT Circuit were attendees asked how they look at the future of sports in Drenthe. Not only were they asked for their dreams, but also what they need AND what they will bring themselves. What is your sport ambition for Drenthe? What do you need to realise this future image? How is your Drentse inspiration when it comes to sport and exercise? The multiple polaroid pictures with personal notes on the picture to the left show how involved the sportsworld of Drenthe is.